UW Computer Science & Engineering is revolutionizing the field of computer science, driven by a powerful vision of its expanding role in the modern university and in the modern world. We are poised to dramatically increase our impact on Washington's students, on our innovative employers and our economy, and on society's greatest challenges. A second CSE facility and related investments in student and faculty growth will enable us to fully seize upon this opportunity—for our students, for our university, and for our region—and to cement our place among a small number of truly preeminent programs in the nation and the world. Our current facility, the Paul G. Allen Center for Computer Science & Engineering, was a game-changer when it came online in 2003. Its laboratory spaces enabled a fundamental shift in nature of our research and education, and its people spaces enabled significant growth in all of our programs. The quality of the Allen Center's facilities has been instrumental in attracting the best faculty, students and staff to UW CSE. This combination enabled our rise to the top echelon. Thirteen years later, the Allen Center is bursting at the seams. In that period we have doubled the size of our undergraduate program, grown our graduate program by 50%, doubled the size of our professional research staff, increased the size of our faculty by 50%, and tripled our annual research funding. 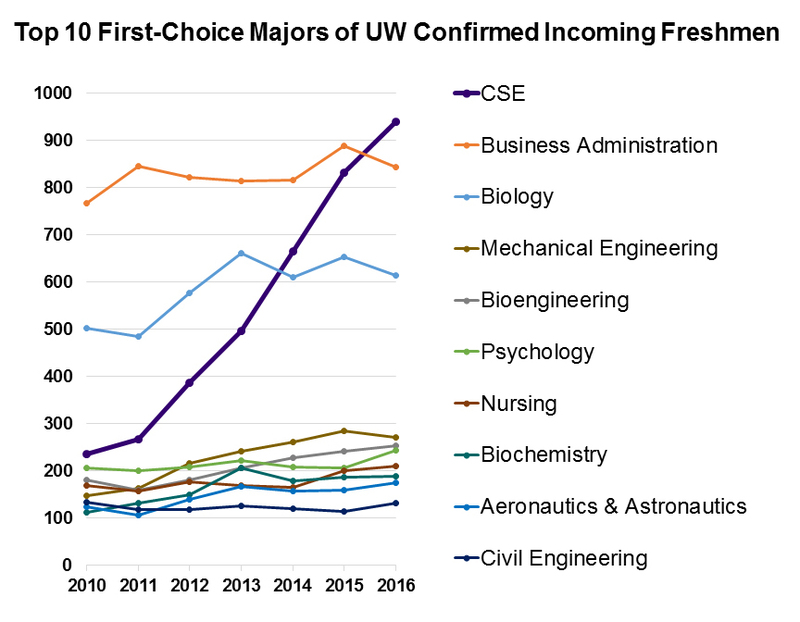 Student demand is extraordinary: UW is experiencing explosive growth in the number of incoming freshmen who list computer science or computer engineering as their first-choice major. Currently, however, only 40% of the UW students who satisfy prerequisites and apply to the major can be accommodated. Employer demand is extraordinary: In our state, the workforce gap (the difference between available jobs and degrees granted) is vastly greater in computer science than in any other field. 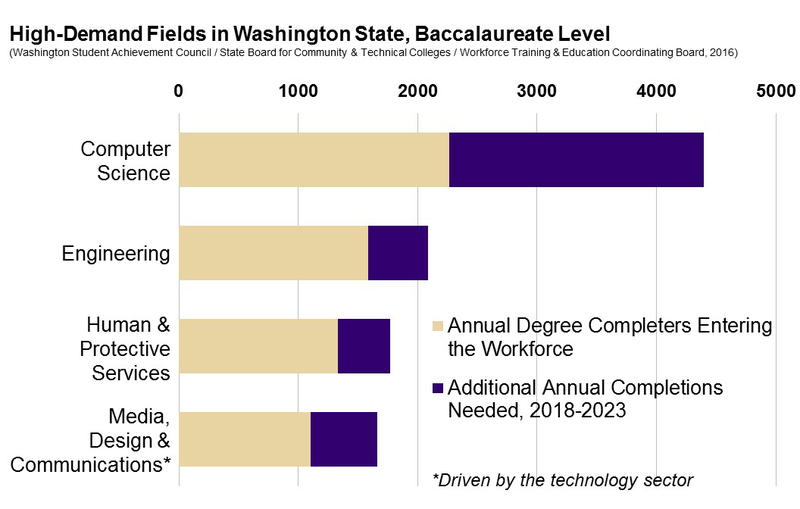 The bachelors-level workforce gap in computer science exceeds that of all other high-demand fields combined. UW CSE is, by far, the preferred provider of new talent to leading companies. Impact is extraordinary: Information technology the driving force for our region's economy. CSE is central to many of UW's signature interdisciplinary initiatives, including the Global Innovation Exchange, the eScience Institute, the Center for Sensorimotor Neural Engineering, and more. The overall potential of a university is increasingly linked to the strength of its computer science program. 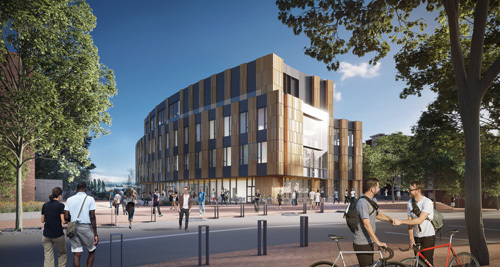 We embarked on a public-private partnership to provide $110 million in funding for construction of a new 135,000 square-foot building on the UW campus. At CSE's 2015 graduation ceremony, Microsoft President and General Counsel Brad Smith announced a landmark $10 million contribution by Microsoft to launch the fundraising campaign. The Washington State Legislature included $32.5 million for the project in the 2015-17 biennial capital budget—$17.5 million from state bonds and $15 million from the UW Building Fund. (UW had previously committed a separate $9 million to the project to launch the design process.) As of January 2017, we had more than $90 million in commitments, including a second $10 million from Microsoft, $10 million from Amazon, $5 million from Zillow Group, $10 million from Google (a mix of support for research projects and research facilities), and individual gifts from more than 100 friends and alumni. Gifts from Microsoft and 13 couples who are long-time friends of the Allen School named the building for Bill and Melinda Gates in an extraordinary gesture of gratitude and friendship. Once completed, this second state-of-the-art facility will complement the Paul G. Allen Center for Computer Science & Engineering and accommodate UW CSE's recent and future growth. 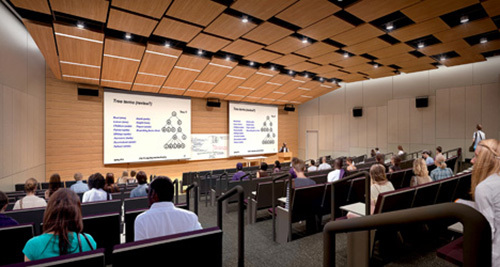 A high-quality, tiered 250-person lecture hall—the Amazon Auditorium—for large classes and department colloquia. Large classrooms, educational labs, and capstone project rooms, as well as a sophisticated maker space. 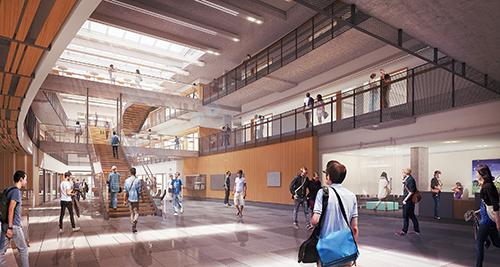 An undergraduate commons where students can study, relax and work together. Workrooms for our outstanding interdisciplinary computer animation capstone, and other capstone design courses. Improved facilities for teaching assistants to meet with students, as well as a large advising suite. Interview rooms where industry representatives can meet with students. Research labs to house Ph.D. students, postdocs and research staff. A large robotics lab to enable us to expand UW CSE's expertise in one of the hottest areas of the field. Graduate student offices and specific areas for students in our 5-year combined Bachelor’s/Master’s program. Special meeting rooms for graduate seminars, research talks and group meetings. Community Focus: Like the Allen Center, the Gates Center is designed to facilitate interaction—both purposeful and serendipitous. The design provides for plentiful breakout areas to nurture a sense of community and to foster collaborations among students, faculty, staff and visitors. The Gates Center will also have a large, flexible event center—the Zillow Commons—that will enable us to host important functions for which we have outgrown our existing event space, giving us an opportunity to engage directly with stakeholders from across the campus, throughout our region, and around the globe. The Gates Center has been designed by Seattle’s LMN Architects, designers of the Allen Center, PACCAR Hall, McCaw Hall, Benaroya Hall, and other extraordinary buildings that have met with acclaim across the nation and around the world. The Gates Center will be located just across Stevens Way from the Allen Center. Proximity is essential because many facilities in the Gates Center will complement rather than duplicate our Allen Center space and enable us to provide an integrated education and research experience. 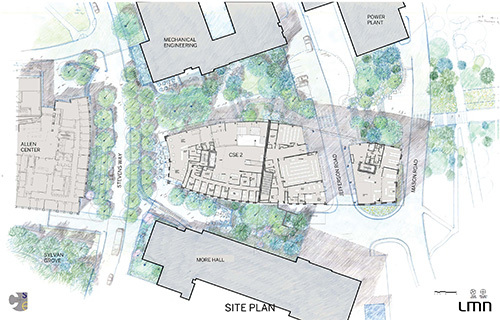 We have engaged the landscape architecture firm of OLIN, led by renowned landscape architect (and UW alumnus) Laurie Olin, to create an outdoor plaza and pedestrian passage surrounding the Gates Center. A café along Stevens Way—named the Microsoft Café to commemorate the company's extraordinary generosity—links More Hall, the Gates Center, and Mechanical Engineering. 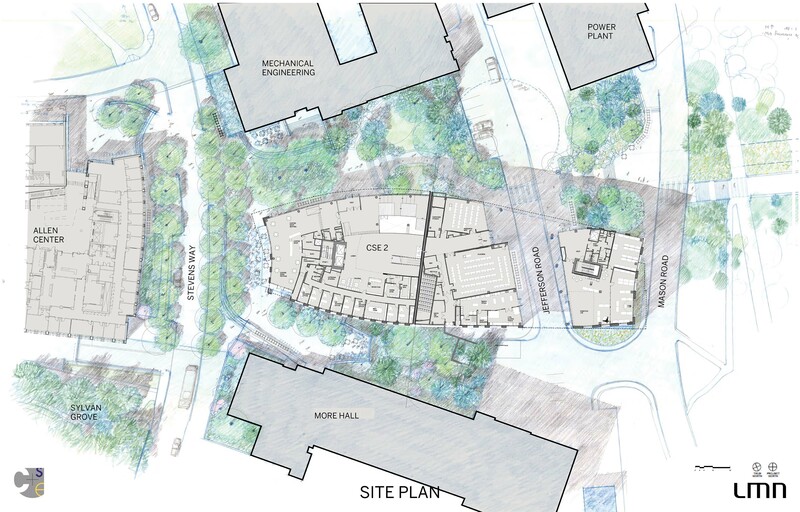 The overall goal is to create a vibrant "Engineering Plaza" at the heart of the section of the UW campus that houses various units of the College of Engineering. In January 2017 the University of Washington Board of Regents authorized the start of construction, although fundraising is not yet complete. We expect to open the Gates Center to faculty, students and the community in January 2019. View the Gates Center image gallery here. Follow the action through live webcams here, here, here, and here. Read more about the campaign for UW CSE and our unparalleled student experience in our campaign brochure here. Explore how UW CSE faculty and students are addressing societal grand challenges and improving lives around the globe here. Join us in creating the future of computer science, and the future of our university and our region!